Did you know you can now order your Deliveroo takeaway from Buddha Bar here on View? 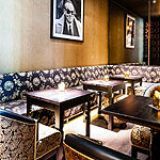 "Buddha-Bar London is a restaurant and bar in Knightsbridge, blending divine pan-Asian cuisine, expert mixology, renowned music and stunning interiors! Signature dishes here include spicy Mango Maki, Spicy tuna tartare, Yellowtail kisame, Wagyu beef fillet with truffle butter. Our sushi & sashimi platters are always sought after, available 7/7. The drinks menu is equally as exciting, with a wide range of wines from the New and Old World, as well as a delightful Japanese sake selection. Signature cocktails : Bubble Wap (strawberry & raspberry puree, rose liquor, elderflower liquor, Belvedere Vodka & Champagne), Kiwi Kukama (Citron vodka, elderflower liquor, fresh kiwi, fresh cucumber and lemon bitters). Thursday nights '1001 Nights' allows Knightsbridge to light up, thanks to our Arabian themed nights involving some amazing live singers, musicians and stunning belly dancers. Following that of course, comes the weekend, where Buddha-Bar shares its best tracks played by the resident DJ Mario. 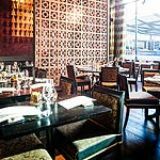 A decadent and unique venue which can host a variety of events, the award winning Buddha-Bar Restaurant London offers exclusive hire, part hire and private dining options over its two floors in the heart of Knightsbridge, London. The venue can accommodate up to 250 diners, with an overall capacity of up to 450 standing. Providing a variety of outstanding event menu options, drinks and impeccable hospitality, Buddha-Bar London offers a completely unique experience with a Far Eastern influence in a fashionable and world renowned venue. Welcoming all guests with our grand entrance, Buddha-Bar has a contemporary and unique interior, featuring bespoke art installations and floor to ceiling hanging crystal dragons. Deep blues, reds and golds feature in our opulent private dining room guaranteeing the wow factor for any event, and leaving a lasting impression with guests. 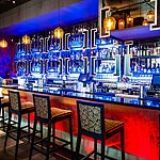 Our signature Buddha-Bar lounge music, and bar area also assist in creating a glamorous yet welcoming atmosphere." By sending this booking your details will only be sent to Buddha Bar and will never be shared with other third parties. By clicking this box you agree to the Terms and Conditions set out above. You can book to reserve an area of Buddha Bar for you and your friends. Just enter your requirements below to see what they have to offer. Do you work at Buddha Bar? What did you think of Buddha Bar? How Over-Priced For Nothing And Pretentious For No One Can You Get? The décor is nice, and the bartenders are super cool, one of them even does magic for his customers, and they don’t mind a complimentary drink at Buddha Bar or there, which is quite refreshing in a city full of tight wods. There own Buddha Bar beer bottles are a cool Buddha man shape yet the beer tastes like a Grolsch. But the extremely high food prices far out-weighs a worth-the-money dinner experience. One could say well a place like that is only for rich people, but let’s look at it from a normal rational perspective. No matter how rich someone is, does it make sense for him to pay £100 quid for a liter of fuel? ...or £50 quid for a pack of cigarettes? ...or £30 quid for a Big Mac you see my point? Sushi prices are now beyond the point of normal, worthy, rational ...it’s at the point of ridiculousness. I would give 2 to the restaurant and 5 to the bar upstairs. There were 4 of us for dinner on a Saturday evening. The receptionist wasn't welcoming and made even worse sour face when she heard a Russian surname. Staff at the restaurant didn't even give us 2 minutes with the menu and came asking if we are ready to order. Forgot to serve my main all together. My starter wasn't superb, it was fairly good. Staff kept on interrupting trying to push in the drinks while we needed a short break and when we were ready to order one more bottle they gave us a bill instead. And we got charged for 2 bottles of water while we only had one. Plus they kept on pouring the water into my glass when I really didn't want the water and when I wanted to have a sip the glass was too heavy and very uncomfortable to hold for my small hand. We were made to feel uncomfortable . Since we were handed in the bill so quickly we went upstairs to the bar, where staff were very welcoming and professional. They were able to accommodate us without the booking after finding out we were almost pushed out from the restaurant. Had a great night at the bar. Shame the restaurant doesn't do the place justice and they judge people by the surname at the reception and by the speed of drinking at the restaurant instead of judging at the end of the night by the final wallet size. I am not sure we'll be back to the restaurant, but definitely loved the bar. My visit to Buddha Bar exceeded any expectations. I had heard about the concept and received recommendations from friends before I went myself. The atmosphere is set from the minute you enter the door; beautifully decorated space with their famously good music playing in the background and staff that seems genuinely happy to see you (even if you don't look like a big spender). The food was served as a piece of art and tasted likewise! The only downside was a mix-up with the order, but the staff handled it well once it was brought to their attention. I will definitely go back. When I visited the London Buddah Bar I already had an image in my head of what it would look and sound like. However, I knew nothing about the food, the drinks and the service. And I was pleasantly surprised. The food was absolutely beautiful - different, oriental and very delicious! (strongly recommend the black cod). We were very well looked after and were offered some great cocktails and desserts by the staff. The venue itself is a piece of art - each aspect of the interior is simply immaculate. I would definitely go again to relive the Buddah Bar experience! Went to Buddha Bar on Saturday night. Horrible service at both the bar area and in the restaurant. At the bar our waitress took 20 minutes to take our drinks order and than forgot the order. Drinks didn't come until we flagged down the manager (40 minutes after we had arrived). When the drinks came they had been sitting so long the contents in the two Bubble Wrap cocktails had separated, yet staff didn't take initiative to remake fresh ones. At dinner, two starter errors - the vegetarian starter wasn't served until the mains arrived and they completely forgot the order of the tuna tartare (which apparently was brought to two wrong tables and still didn't make it to ours). Manager took service charge and the price of a few beers off the bill - not enough to make up for the experience. Food was tasty but overpriced. Music and decor fantastic - loved the crystal dragons and floating Buddha. London has too many great restaurants to give a place like this a second chance. The Buddha Bar delivers Asian fusion for the fashion conscious. 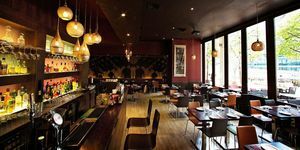 Adjacent to The Bulgari Hotel and around the corner from Harrods, it doesn't get much swankier than Buddha Bar's Knightsbridge location. Unsurprisingly the split-level venue is suitably trendy and as far as drama goes, it has it in abundance – from the burly bouncer on the door to the stage-like lighting and sweeping staircase. 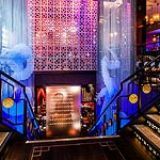 With its elaborate Chinese dragons suspended in crystal droplets from floor to ceiling, stepping into Buddha Bar is like embarking into an theatrical West End den; and with an entrance like this, expectations are bound to run high. Half bar, half restaurant, it's a strange mix of contemporary baroque, meets flashy Eastern glamour. Lights, tones and textures are thrown at you from all directions and one thing it certainly isn't is dull. Not least when it comes to the soundtrack, where anything from Hispanic tango to traditional oriental music and popular dance mixes can be heard blaring from the speakers. The service is super efficient, but with more staff than diners, it can sometimes feel rushed and a leisurely three-hour dinner is unlikely to be on the cards. Where Buddha Bar has got it right is the food. Sushi, sashimi, salads, tempura, gyoza – and that's just the small plates. The menu is vast and so tempting you'll want to try it all, so decide at the outset whether you'll dine tapas-style or opt for starters and mains. For tapas-style dining, ordering as you eat is a good option. If not, two small dishes to share, followed by a main and side each will satisfy the average appetite. Recommended is the chilli salt crispy baby squid (£9), a sizeable portion in light tempura batter and just a hint of spice. Sushi fans will revel in the maki selection, particularly those created exclusively at Buddha Bar. Of note is the spicy mango maki with king crab and prawn tempura (eight pieces, £17.50). Pricey at over £2 a piece, but a work of art on presentation and with its creamy zing and moist crab flavours, more than pleasing to the taste buds. For mains, the spicy lamb rack with cucumber and fennel salad (£22.50) is flavoursome, if small. Overall, the mains are lacking in comparison to the starters in terms of both size and taste. The monkfish in coconut lobster bisque (£27) has promise but is devoid of depth and for just a few discs of actual fish, it would be easy to feel stung at the price tag. Desserts, though, are a delight, particularly the chocolate and kumquat (like a Chinese orange) pudding with coconut sorbet (£7.50). Essentially a soufflé, it's warming gooeyness and rich coco taste is something akin to a Terry's Chocolate Orange heaven. With all the benefits from the bar upstairs, the drinks list is varied. Cocktails start from £12.50 including a selection of Buddha Bar signature creations. Given that it's East-meets-West, kicking off with a glass of Champagne (Veuve Clicquot Brut Rosé, £15) is a fitting treat and an unexpectedly satisfying pairing. There's also a short but quality list of wines available by the glass or bottle – and of course, sake, for the traditionalists. Buddha Bar does a lot right; the small dishes in particular are on point and in terms of portion-to-pound ratio, these tapas-style plates are perhaps the best bet. However, there is a slight disconnect when it comes to the experience. While Knightsbridge is hardly known for being unpretentious, the members' club ambience feels a little clichéd. The blaring music selection – eclectic to say the least – coupled with the over-styled décor makes it more try-hard than trendy, which is a bit of a shame as the food is so darn enjoyable.